The blurred out section has my email and phone number. Sorry! I didn’t want to publish those online for just anyone. Meet me in person and I’ll happily give you a card. The back side of the card was actually the easy part. As part of this new domain launch I came up with the idea of the four banners to represent my interests. It made sense to use those on my card as well. The front side of the card was harder. I wanted to make it visually interesting, but I didn’t want to clutter it up with unnecessary information. First I tried putting a photo of myself on the card, but that felt a little narcissistic. Then I tried replacing the photo with a QR code that would take you to my website. That was ok, but it looked superfluous and a little disingenuous since I’ve never even used a QR code before. 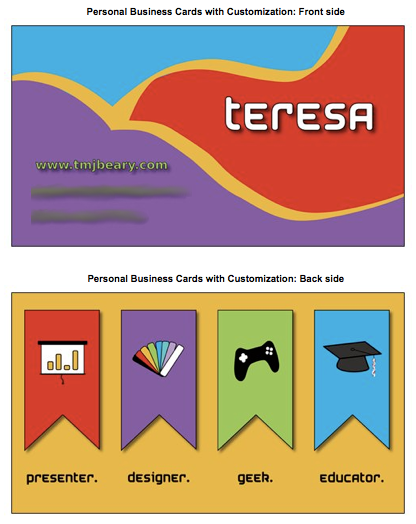 I had struggled because I was trying to keep all of my contact info in the red portion of the card, so I felt that I needed some element on the left to balance it out. Instead of adding junk, I realized I should just move the contact information to the left to balance the design. I like the final design that you see here. If I hand out enough cards to warrant a second printing I might adjust the front some more. We’ll see what kind of feedback I get.